Recent policy initiatives driven by Dr. Kathryn Boor, Dean of the Cornell University College of Agriculture, have the potential of providing a dynamic and lasting impact on the economic future of the Finger Lakes, and the entire business path of New York State’s food and beverage industry, our State’s largest job producer. Our region has long been home to a research station conducting great world class applied scientific research in agriculture and technology. Unfortunately, the image of the station too often gets blurred because of its all too confusing name as the Cornell University, New York State Agricultural Experiment Station (NYSAES). To remedy this, Dean Boor believed a new brand was needed that more clearly defines the Station’s genuine economic and job development impact, and Cornell AgriTech was born. Cornell AgriTech scientists at the Station are deeply engaged in all aspects of food and crop development, including plant disease resistance and pesticide control; assisting food entrepreneurs make new products; engage in cutting edge research; create new varietals of apples and other horticulture products, and assist winemakers and craft brewers understand the science impacting their products from the field to the glass. Additionally, scientists at the Station oversee all aspects of food safety handling and processing procedures, as well as conduct ground breaking research and analysis in high pressure food preservation. Those thousands of fruit and vegetable growers, food processors and winemakers in New York State who have been positively impacted by the great agricultural research conducted for decades in Geneva in the heart of the Finger Lakes, are familiar with the Station’s vitally important research and agree it is essential to the job producing food industry in New York State. Included with the food industry is also the beverage industry. Both the wine grape industry and the craft beer and beverage industry have seen explosive growth in New York in large part because of the scientific research conducted by Cornell, and especially its applied research arm at the Station in Geneva, now Cornell AgriTech. The scientists at Cornell AgriTech conduct interdisciplinary research and discovery in laboratories and 900 acres of fields, orchards and vineyards. Their work covers the continuum of food and plant research from farm to fork, from plant pests to biofuels, and from food security to the impacts of climate change. This work has pioneered the development of over 280 new varieties of fruits and vegetables, cutting edge breakthroughs for pest control, and food preservation. The importance of the decision to rebrand Cornell AgiTech was made clearer by the success of Cornell’s urban center, Cornell Tech, on Roosevelt Island in New York City. Cornell Tech currently has more than 300 graduate students, across a wide range of fields. Most importantly, 40 startup companies have been spun out of Cornell Tech in the past four years, growing jobs in New York State that would have otherwise been created elsewhere. One of the most interesting and impactful statistic is that approximately 14% of students who graduate from Cornell’s Tech campus either work in a start-up company, or form a new start-up business themselves. Dean Boor is an outstanding leader, and continually encourages Cornell University, and especially its College of Agriculture, to provide a steady flow of enterprise, entrepreneurship, a consistent talent pool and additional job growth in the Finger Lakes and throughout the important New York State food and beverage business sector. The Dean’s mission was direct: let’s build upon the job development aspects of Cornell Tech in New York City, and those underpinnings are how Cornell AgriTech and the New York State Center of Excellence for Food and Beverage were created. Fortunately for our Finger Lakes region, important stakeholders and leaders joined Dean Boor to amplify the agricultural advocacy that lead to the creation of the Center of Excellence for Food and Beverage in Geneva, at Cornell AgriTech. Bill Strassburg, Vice President, Strategic Planning at Wegmans, uses this key graphic in his presentations promoting statewide recognition of an important food and beverage industry cluster to be centered at Cornell AgriTech in Geneva. Click to enlarge. Bill Strassburg is one of those leaders. As a long serving senior vice president at Wegmans Foods, Bill has been actively involved in the Finger Lakes Regional Economic Development Council, and has been articulating this concept for many years. Bill envisioned the statewide recognition of an important food and beverage industry cluster to be centered at Cornell AgriTech in Geneva. This job creating food and beverage cluster stretches across our Finger Lakes region, through western New York, into the State’s Southern Tier and Central New York regions, and extends to the mid-Hudson and Long Island agricultural regions. 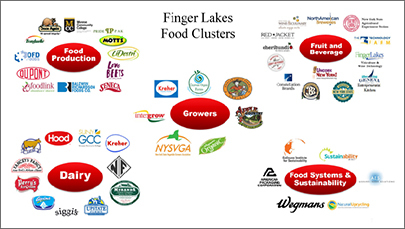 The Finger Lakes would be the center for the focused development and expansion of innovative ways to nurture, grow, harvest, process, manufacture, package, deliver and prepare the food and beverages we eat and drink. Jan Nyrop, head of the Cornell AgriTech at the New York State Experiment Station in Geneva, John Johnson, Director of the Agriculture and Food Technology Park, and others have joined together to support a great concept that could enhance the Finger Lakes economy for generations to come. Over the years, Centers of Excellence have been established across New York by Empire State Development to foster collaboration between the academic research community and business sector to develop and commercialize new products and technologies, and facilitate workforce training. Centers have been established in academic studies such as infotonics, nanotechnology, and data science. The purpose of the newly created Center of Excellence for Food and Beverage is to grow the food processing business sector and related industries, with the goal to enhance the creation of good quality jobs, career opportunities, and significantly enhanced business investment in the region and across New York State. 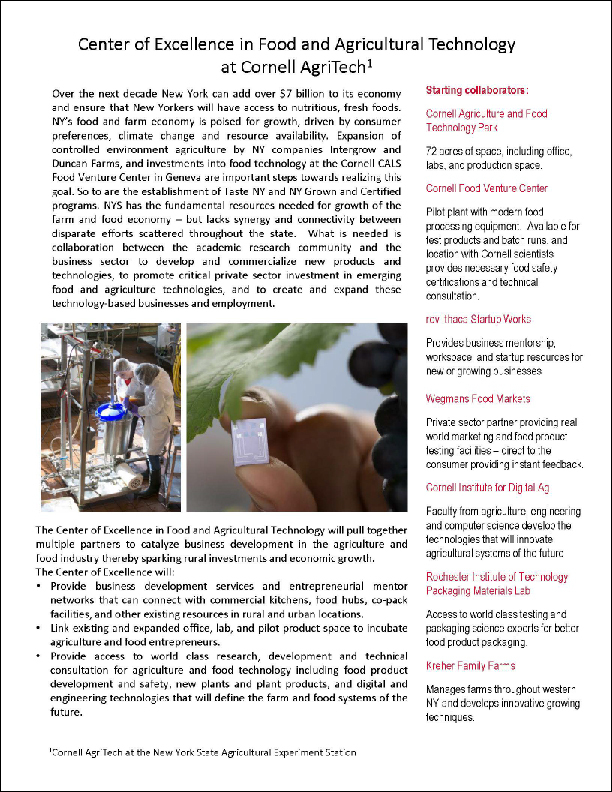 Cornell AgriTech page outlining the Center of Excellence. Click to enlarge. The Center of Excellence for Food and Beverage would provide food entrepreneurs, whether farm or factory based, with connections to resources, technical assistance, and connections to a larger food network. This region possesses all the right ingredients: world class leadership in agricultural research, food processing, food safety and sustainability. The cornerstones in the region are further defined by Cornell University’s College of Agriculture in Ithaca and the Cornell AgriTech in Geneva, the Rochester Institute of Technology, which has extensive programs in the research, design and development of food and beverage packaging, and Syracuse University as a leader in the environmental sciences. Located within a day’s drive of over 100 million people, the Finger Lakes region has the potential to gain from highlighting our strengths and to expand our economy by further developing the world’s second most important commodity…food. A final thought: The Finger Lakes-Lake Ontario watershed, extends from New York’s southern tier and empties into the Great Lakes, which together contain 20% of the world’s fresh water, the most important essential of all our natural resources. This is a treasure for our Finger Lakes region, and makes it such an ideal location for the future development of agricultural production and technology. Michael F. Nozzolio represented the Finger Lakes in the New York State Senate and Assembly for over three decades. He is a partner in the law firm Harris Beach, a member of the Cornell University College of Agriculture Advisory Board, and CEO of the economic development initiative, LOCATE Finger Lakes.